A woman whose home had been burglarized recognized one of the burglars as her cousin. On Wednesday, March 13, at approximately 7 p.m., Creek County Sheriff Deputy Michael Holladay was dispatched to a personal residence on South Maple Drive in Kellyville to investigate a burglary complaint. Upon arrival, he spoke with the reporting party and resident of the home, Kara Edwards. Edwards stated that she had left home around 7:30 a.m. for work that day and did not arrive home until 6:15 p.m. When she pulled into the driveway, she noticed several tire tracks and assumed they belonged to her boyfriend’s brother’s vehicle. But when she pulled up to the back door, she saw broken glass. When she opened the back door, she could see that her 70-inch Vizio television was missing from the front room and that all the glass had been broken out of a nearby cabinet. Nothing was missing from the cabinet. Edwards then went to search her bedroom and saw that all its contents had been rifled through and flung about, including the shelves from two sets of dresser drawers. At this point she realized her .40 caliber Smith and Wesson firearm was missing, along with a laptop computer and a Google Chromebook computer. Deputy Holladay confirmed Edwards’s assessment of the home and observed several boxes of live ammunition and an empty black holster for the Smith and Wesson in a dresser drawer. While sheriff deputies gathered information and took pictures of the scene, a friend of the victim’s was at the residence and was able to review surveillance video that had been taken during the burglary of the house. Edwards was able to positively identify one of the three suspects on the video as her cousin, Bobby Joe Hurt. The video showed another male in the house and a female driving an Acura and pulling into the driveway just before the burglary. The driver appeared to exit the vehicle and participate in the crime. Edwards was unable to identify the second male or the female. The following day, Thursday, March 14, at approximately 5 p.m., Deputy Holladay again made contact with Edwards at her residence. She gave him a copy of the surveillance video and the names of the other two suspects. The male was identified as Jesse Wise and the female as Cameo Foster. Edwards further advised that her cousin Bobby Hurt was currently at his mother’s residence in Kellyville, and that his burnt orange Dodge Nitro should be in the driveway. Holladay went to Hurt’s mother’s home, and did indeed observe an orange Dodge Nitro in the driveway. He made contact with Hurt’s mother, Christie Brumley, who stated that she had not seen Hurt in two days and did not know where he was. Holladay asked for Brumley’s consent to search the residence for Hurt, which she gave. When Creek County Sheriff Deputy Bailey arrived on the scene, he and Deputy Holladay proceeded to search the home. A short time after entering the residence, they observed a male subject walk out of an upstairs room. He came downstairs and identified himself as Bobby Hurt. He was read his Miranda Warning and agreed to speak with Deputy Holladay. Hurt was initially evasive and would not admit to his involvement with the burglary. However, when confronted with the evidence of the surveillance video, Hurt broke down and admitted to being involved in the crime. He identified the other male in the video as Jesse Wise, and the female as a woman named Cameo. He did not know her last name. Hurt stated that Wise had all of the property that was taken during the burglary, which included two laptop computers, a large-screen television, and a handgun. He also told the deputies that Wise was staying in a house in the area of Highway 33 and 369th West Avenue and agreed to fill out a written statement. At approximately 6:30 p.m., sheriff’s deputies, including Holladay, Bailey, and Tracy Napier, arrived at the home where Wise was living. They attempted to make contact for 30 minutes before a male emerged from the residence and was identified as Jesse Wise. Wise was told why the deputies were there, but claimed he would not consent for them to search the house since he was not the owner. The owner, Jamie Kleven, was reached by phone and apprised of the situation. She told Deputy Bailey that she was on her way home. While waiting for Kleven to arrive, Wise was read his Miranda Warning and agreed to speak with Deputy Holladay. He admitted to his involvement in the burglary and stated that one of the laptops was in his vehicle and that the other he had sold to someone in Sand Springs. He further stated that Hurt told him he could keep the two laptops and television as long as Hurt kept the handgun. When Kleven arrived, she gave verbal and written consent for the deputies to search her residence for the stolen property. 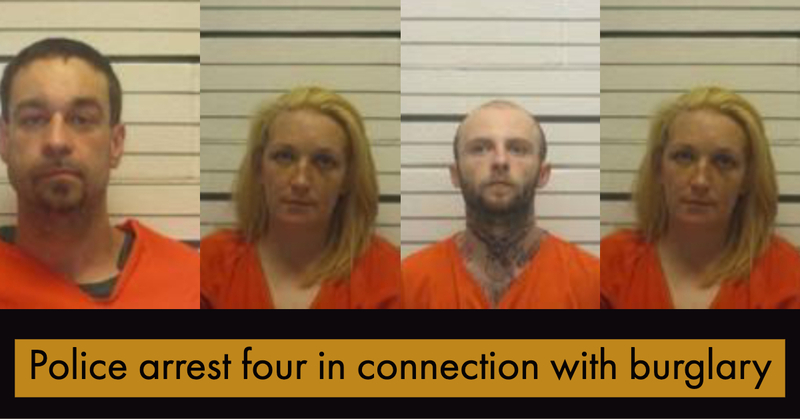 While searching the house, deputies encountered a female subject babysitting Kleven’s three-year old twin children, and Cameo Foster, who was in the shower. Foster was allowed to dress, then was read her Miranda Warning. She agreed to speak with deputies. During their search for stolen property, deputies located a container of marijuana and a container of clear glass pipes commonly used for smoking methamphetamines. One of the pipes contained residue that field-tested positive for meth. These containers were found in the same area of the house where the minor children had been prior to deputies making entry. Therefore, the mother and owner of the house, Jamie Kleven, was also read her Miranda Rights and arrested. She stated that some of the items were her ex-husband’s and that she had been trying to clean it out of the house, but that she was aware that they were there and took full responsibility for them. Meanwhile, Sheriff’s Deputy Arnold returned to the Hurt/Brumley residence to ask Hurt about the still-missing handgun. Hurt’s mother, Christie Brumley, stated that Hurt was not at home and that he had gone to Walmart. Arnold had Brumley call Hurt so he could speak to him about the matter on the phone. Eventually, Hurt admitted that he had the gun, and told Arnold that he had hidden it underneath the foam topper on his bed. Brumley gave Arnold consent to locate and retrieve the weapon, which he did. The victim, Edwards, was told she would be able to pick up the laptop computer, handgun, and television, and her cousin Bobby Hurt was eventually located and arrested.